We all need a break sometimes! 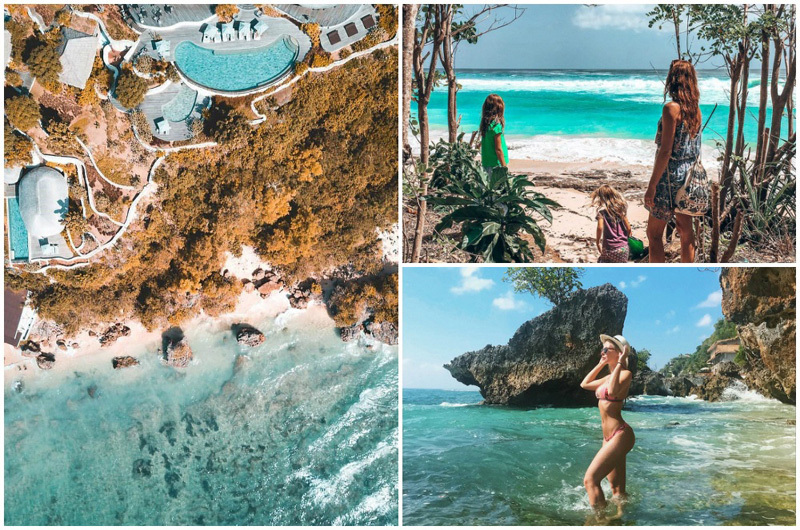 If you’re seeking a little island getaway from the daily 9-5 grind, you’re not alone. 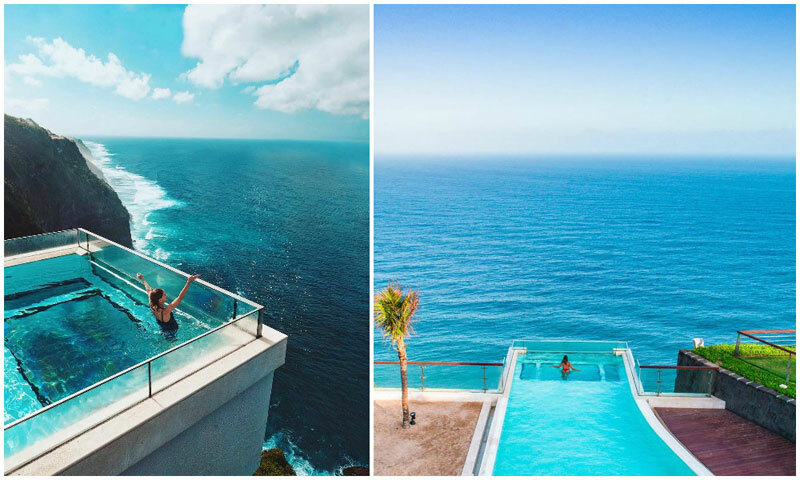 But a vacation isn’t really a break unless you’ve got an infinity pool, right? 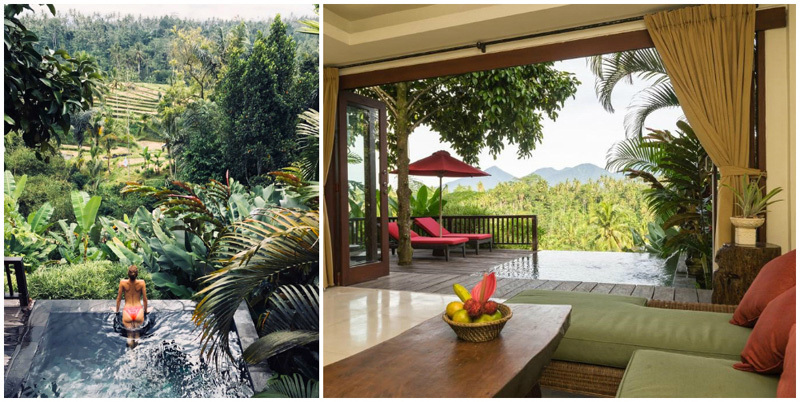 We now introduce you our latest favourite finds offering infinity pools with views so stunning that you may consider staying in Bali forever (and we wouldn’t blame you!). 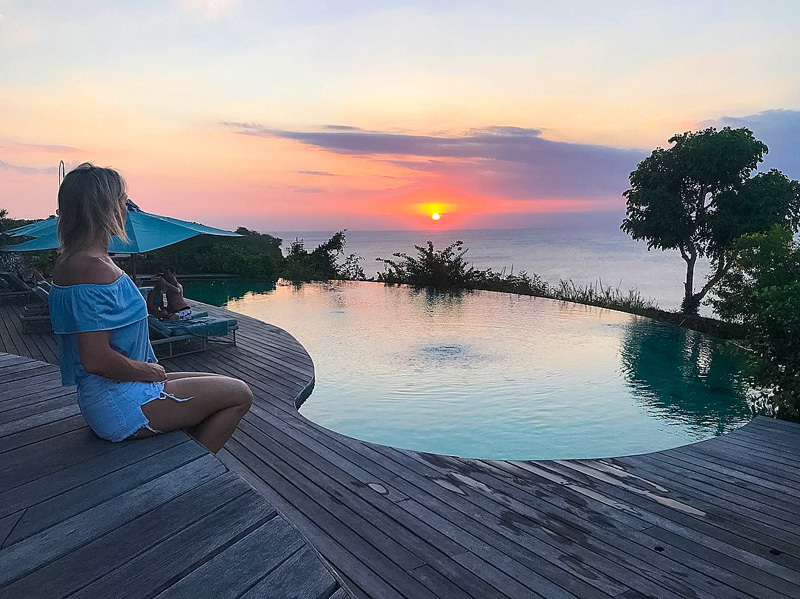 These hotels allow you to experience the more untouched parts of Bali, where hiddens gems are still hidden, and you can experience the true heart and soul of Bali without feeling overcrowded by tourists. 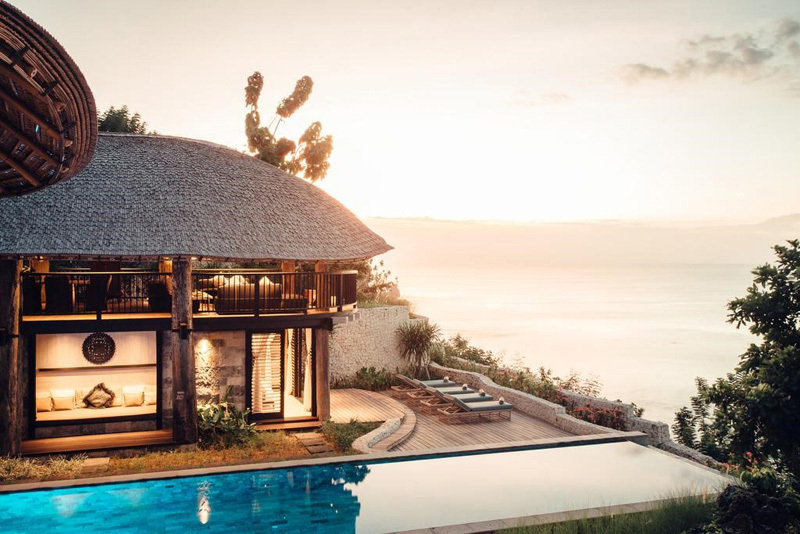 For those who can’t quite get enough of infinity pools and Bali’s wild and beautiful nature, you might want to start planning your next little getaway, starting with these 15 resorts! 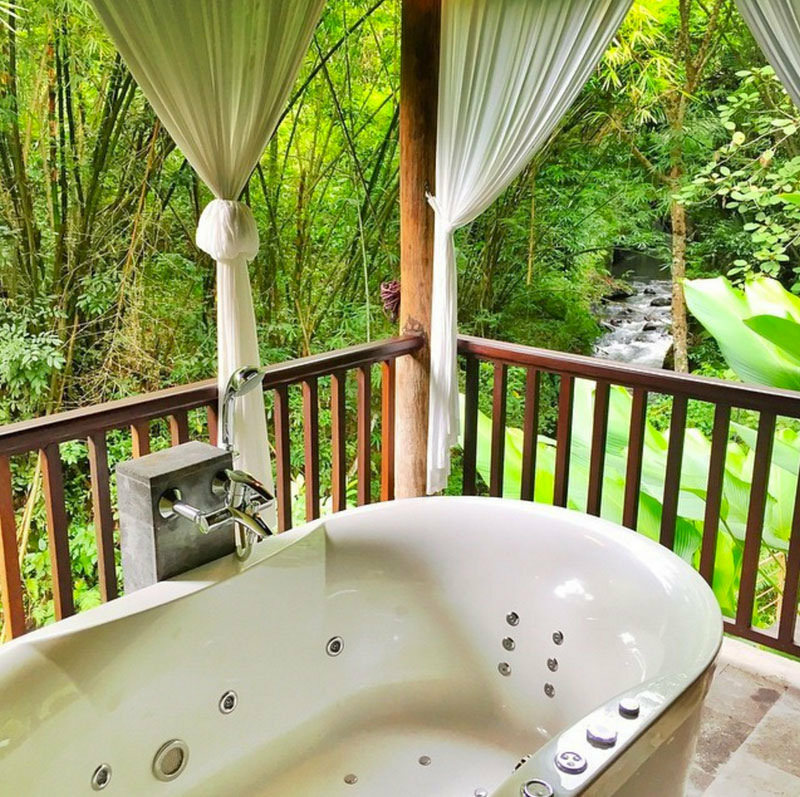 If your love story is a dance across Ubud’s most beautiful tropical rainforest valleys, you need to surprise your sweetheart at one of Bali’s secret Eden. 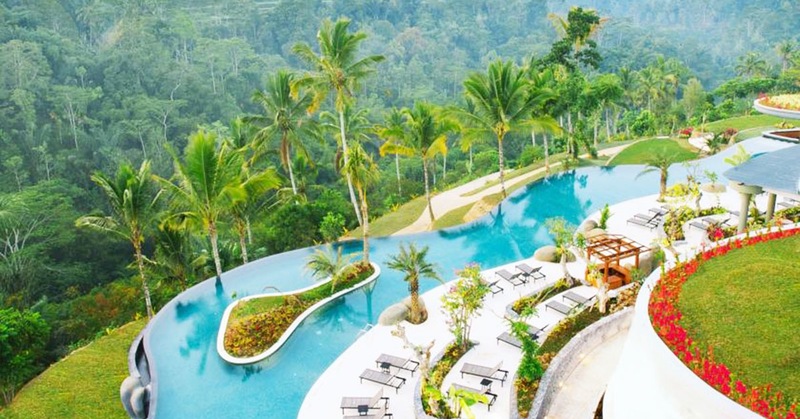 Wake up in the morning and slip into the 89-metre-long heated infinity pool (Bali’s longest!) 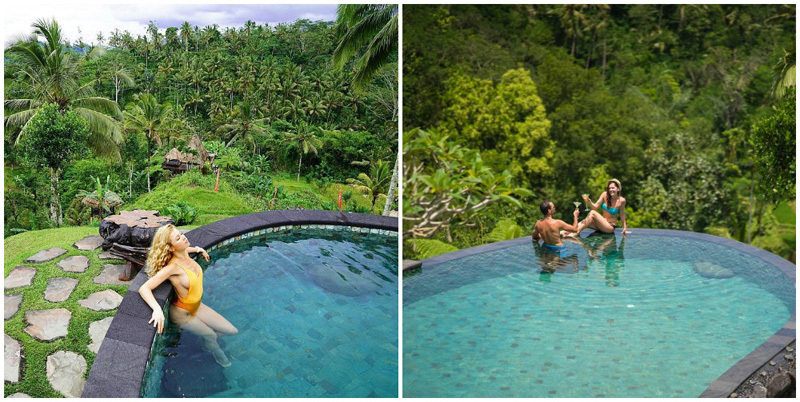 atop the lush bamboo forest at Padma Resort Ubud, where you can marvel at the vast greenery below, with canopies kissed by the gentle morning rays. As the steam from the pool rises to the chilly Payangan hill breeze, you’ll find yourselves soaking in the mist among the clouds. 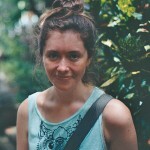 Who says you can’t find magic in Ubud? 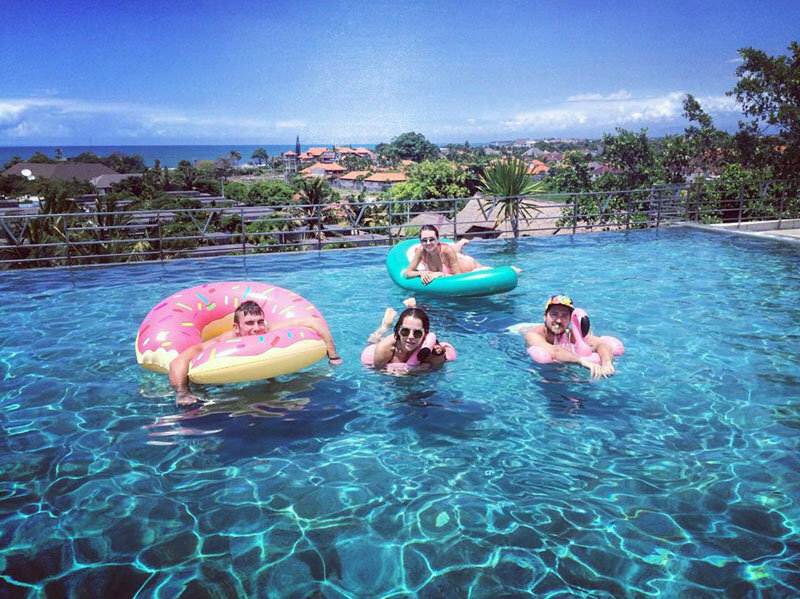 Breakfast is an Insta-worthy affair with their floating breakfast* in a hidden pool! Or you can choose to dine at Puhu Restaurant & Lounge, where you can dig into your morning buffet with the same killer views. If you’re a mermaid and can’t stay out of the water, don’t forget to order up a dazzling cocktail from the swim-up Pool Cafe and Bar, where you can have your drink without even getting out of the pool! Order up healthy vegetarian and gluten-free snacks from the menu too! Don’t miss the popular themed dinner in the evening too! 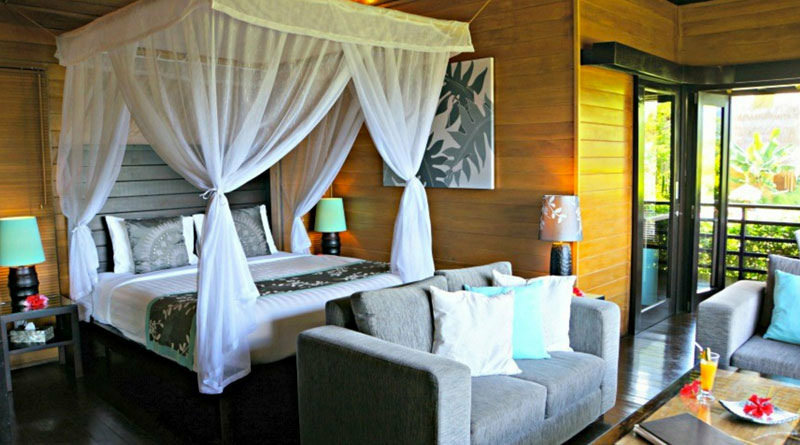 For bedtime, pamper yourselves at the Premier Club Room, which boasts a spacious room that opens up to a balcony with tranquil views of the rainforest. 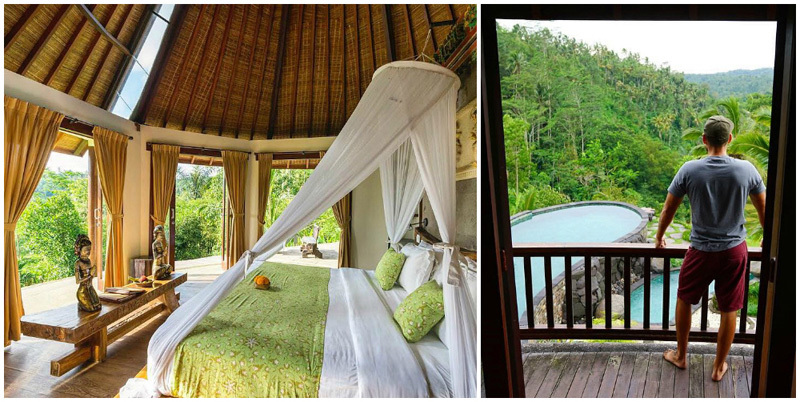 Here, you can be lulled to sleep by the song of the crickets and wake up to the chirping of the birds. This is that refreshing break you need from city life so you can reconnect with nature! If you want to spoil yourself even more, we recommend the One Bedroom Suite, where you and your sweetheart can take a romantic soak in the outdoor bubbly jacuzzi on the balcony! How much sweeter can your honeymoon get? P.S. If you are not staying at the resort, you can also enjoy the stunning heated infinity pool with the Swim and Dine package, which includes access to the infinity pool, dining credits at The Pool Cafe and Bar, and afternoon tea at The Puhu Restaurant and Lounge! 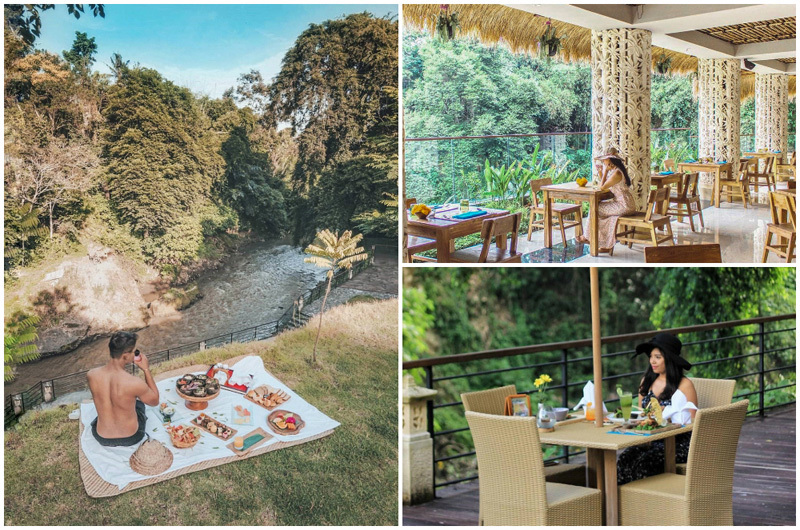 *The Secret Floating Breakfast can be booked 2 days in advance at Rp.550,000+ per couple (approximately USD 38), subject to availability, and you will still be entitled to the buffet breakfast at The Puhu Restaurant and Lounge. 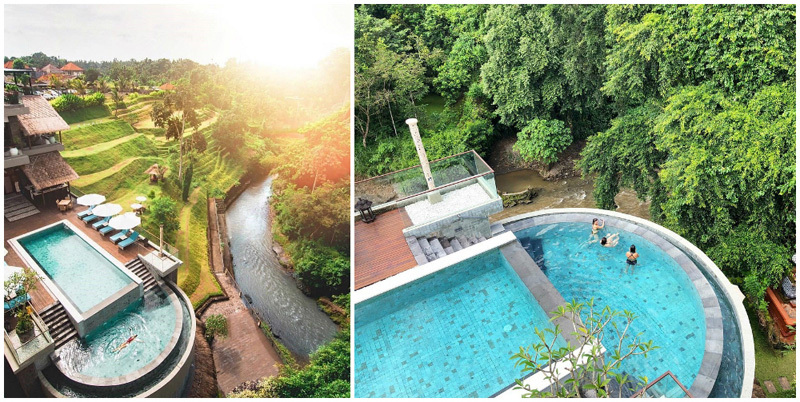 Also: Read about our review on stay & experiences at Padma Resort Ubud! 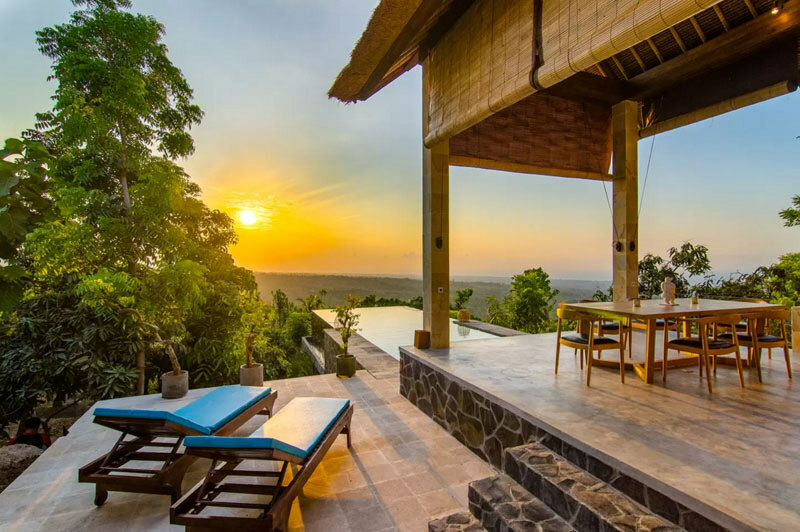 Located in Majangan Village about a 30-minute drive from Ubud, Adiwana Dara Ayu Villas is any traveller’s dream come true. 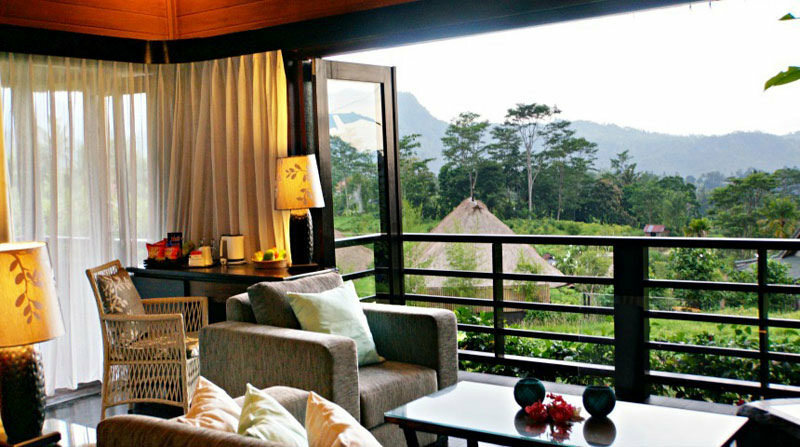 Upon arrival, be ready to be welcomed by beautiful scenes of rice paddies, wild jungle forests, and misty morning views. 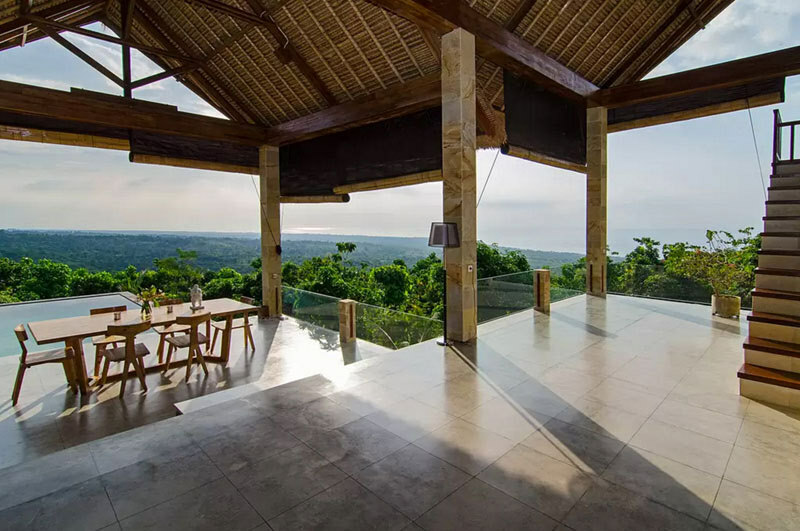 In such a quiet place, this is the ultimate spot for a low-key vacation getaway, even if only for a few days before you return to the main neighbourhoods in Bali. So don’t feel too guilty if your time here is spent mostly in your infinity pool, gazing out at the view. Because when it looks like that, you can’t not spend a little time to take it all in! For a little side of pampering, be sure to draw yourself a calming bath in the sunken stone bathtub of the villa’s outdoor bathroom. Bonus points if you snap a picture of the tub for your Instagram! 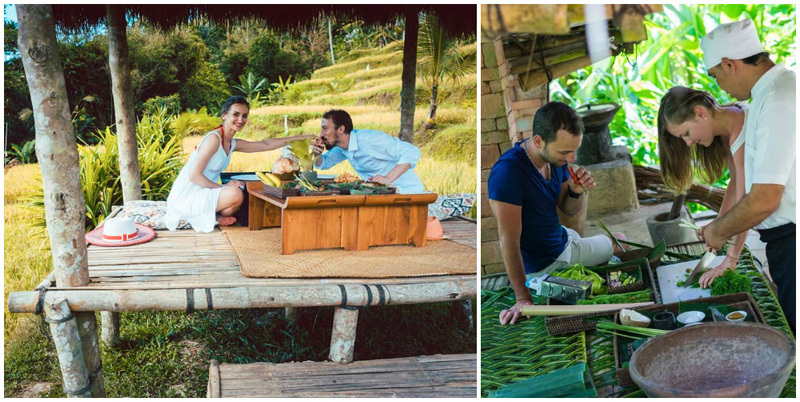 If you do feel like being productive one day, you can also take part in the traditional Balinese cooking classes offered by the villa — because really immersing yourself in the culture of the island will bring your stay to a whole new level! 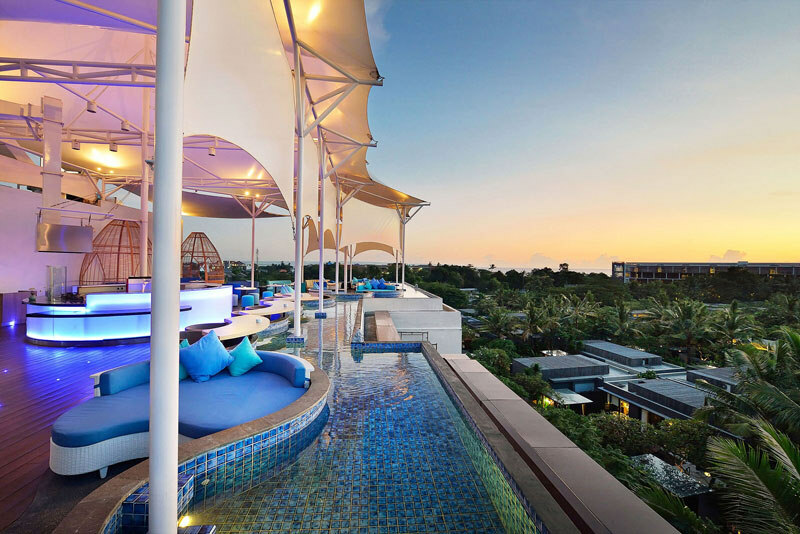 Tucked away in a quiet corner of Seminyak, the Golden Tulip Devins offers a delightful and indulgent getaway for sun-loving holidaymakers. 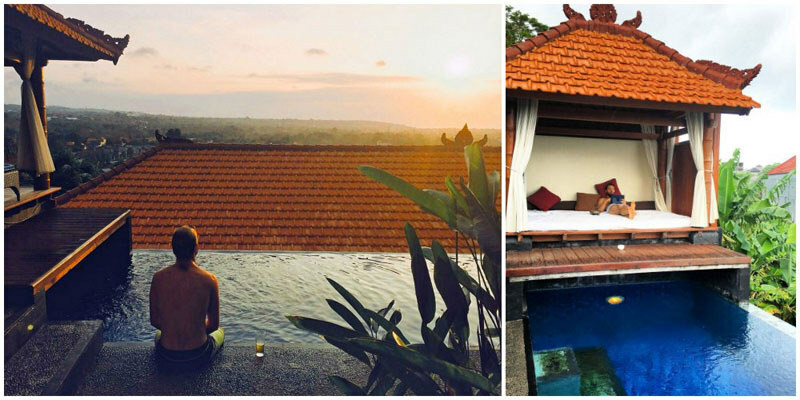 Even if you don’t book a room with your own private pool, the rooftop infinity pool is outstanding. 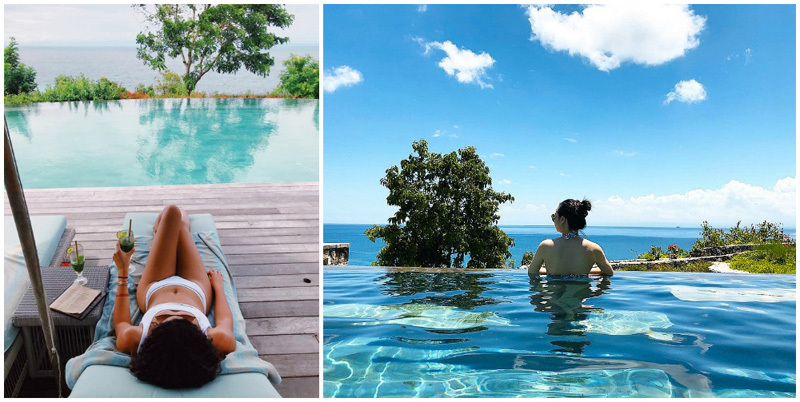 From the nearby sun beds, the unbridled view of the sea is instagram-worthy. 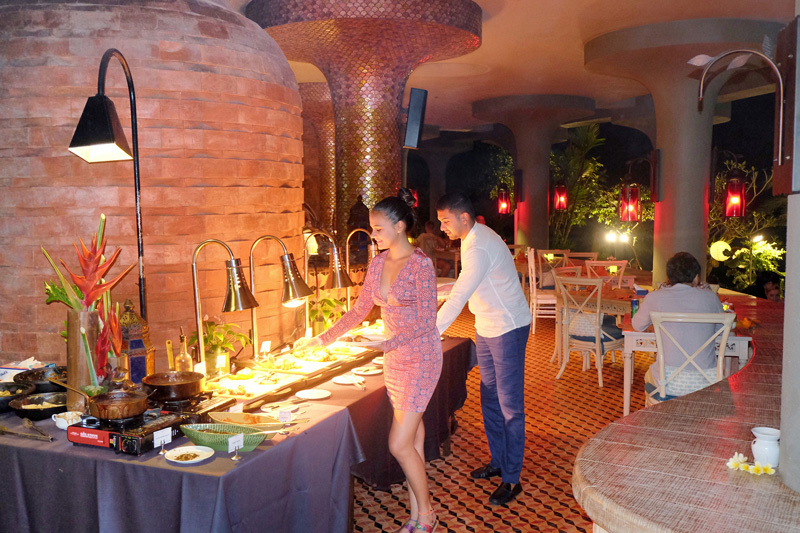 Hotel staff is on hand to serve you tropical beverages and evening tapas while you relax. Don’t miss the opportunity for a sunset swim. The colors create a romantic setting unlike any other! In addition to the breathtaking views from the pool, guests will have the opportunity to take advantage of a full-service spa and indoor, aquatonic pool. The 108 spacious guestrooms provide holidaymakers with all the necessities for a relaxing and memorable vacation. Better yet, you’ll enjoy luxurious amenities. 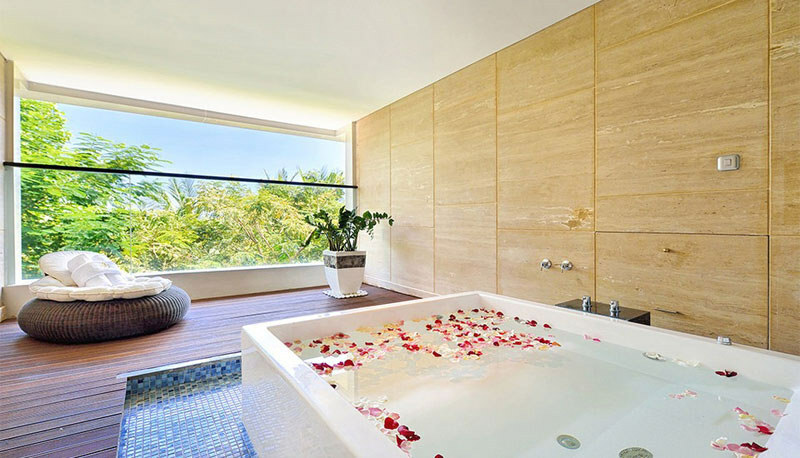 Some rooms even include astounding private jacuzzis with a view. 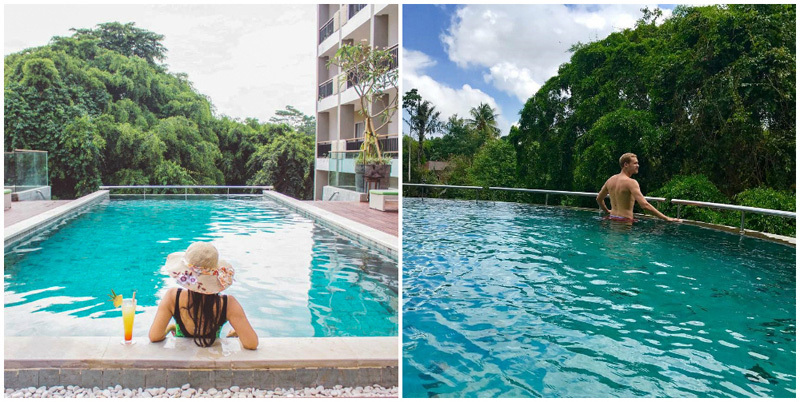 While we wouldn’t blame you if you spent the entirety of your stay relaxing at the rooftop pool, Golden Tulip Bali affords easy access to all of the Seminyak attractions. Hip shopping and the famous beaches of Petitenget and Batu Belig are just a short drive away. Ever wondered what it might be like to slip out the front door of your room and right into a swimming pool? 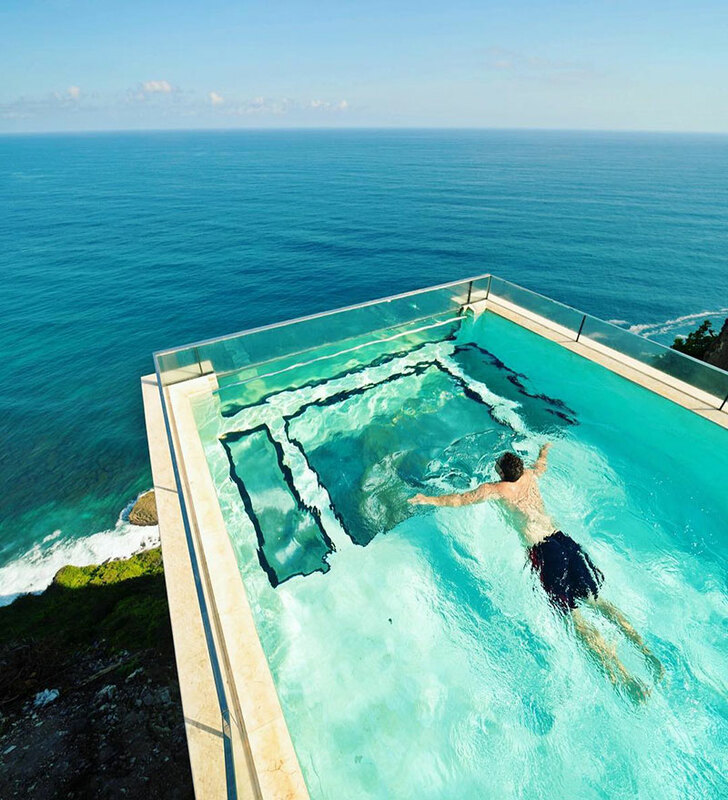 Wouldn’t it be even better if that pool had gorgeous sea and valley views? Jimbaran Cliffs Private Hotel & Spa can make your dreams come true. 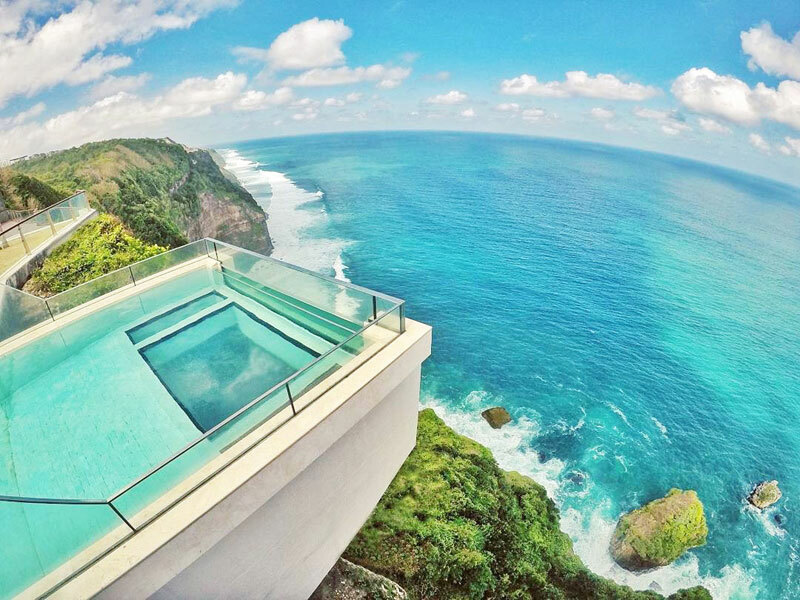 Cascading down the cliffs of Jimbaran, the Cliff Edge Pool Suite boasts of a private infinity pool overlooking the surrounding valley and the sea. To make the hotel even more luxurious, there are two additional shared infinity pools with panoramic sunset views and a spa facility. 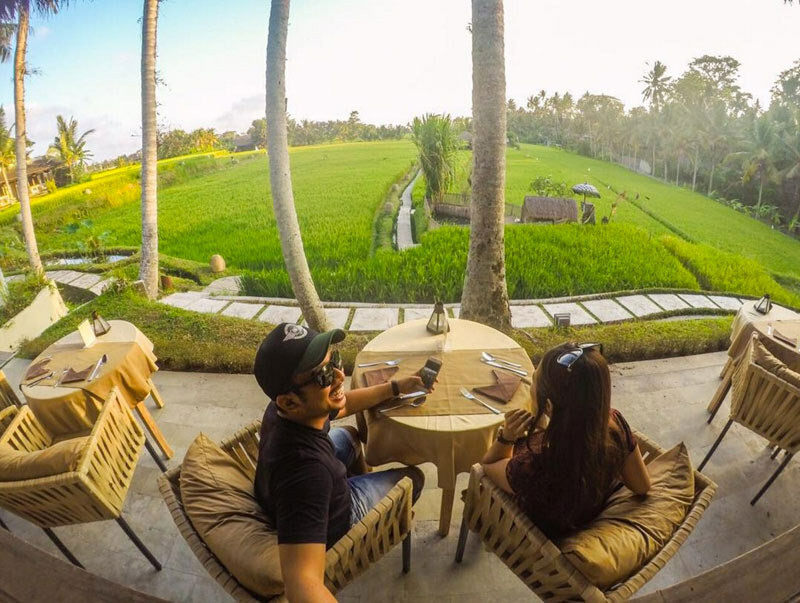 Because of its location 15 minutes from Ngurah Rai International Airport, this cliff-top hotel is the perfect place to relax while surrounded by Balinese farmland. 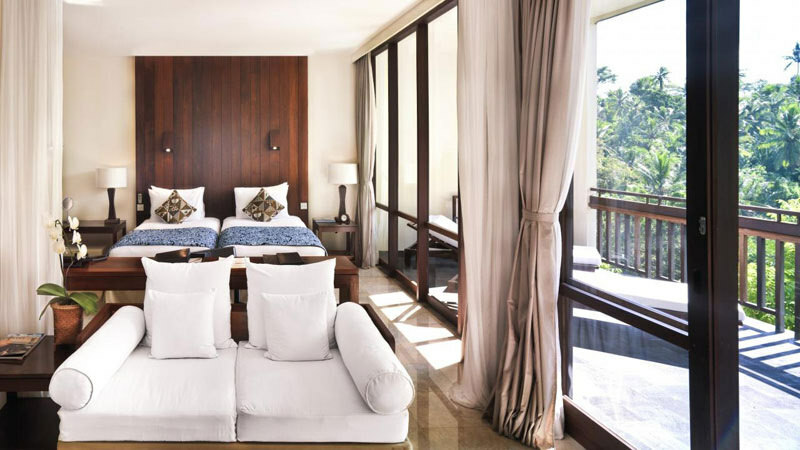 With only 8 rooms, the Jimbaran Cliffs Private Hotel & Spa offers personalised service to suit every guest’s needs. Each room includes its own balcony and a spacious bedroom. You can dine under the stars or enjoy a private, early morning swim, the choice is yours. 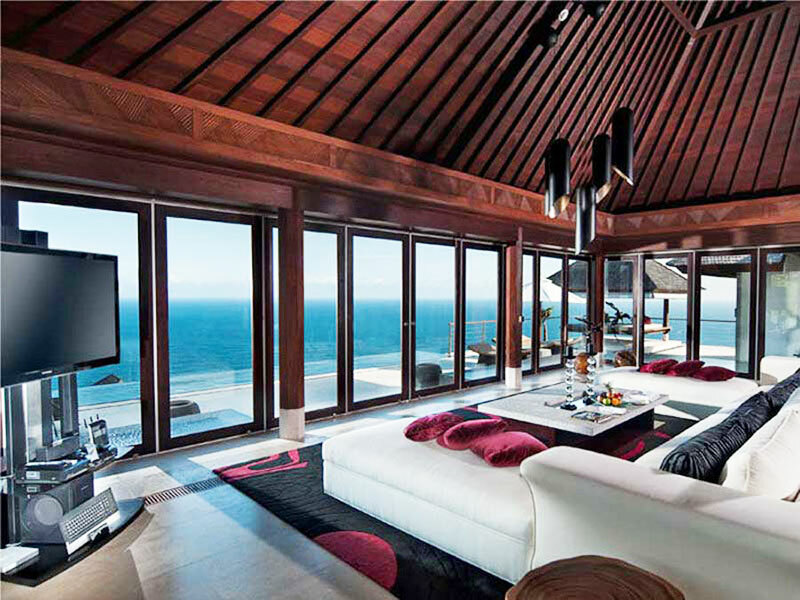 Budgets can be a pain, especially when some villas are just too good to give up. 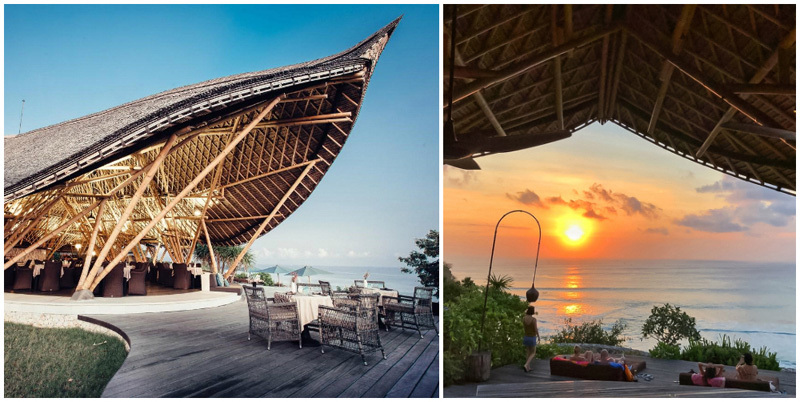 This newly built villa in North Bali is one of them. With its private infinity pools stretching out into the horizon, it delivers spectacular views both in the daytime, and at night. 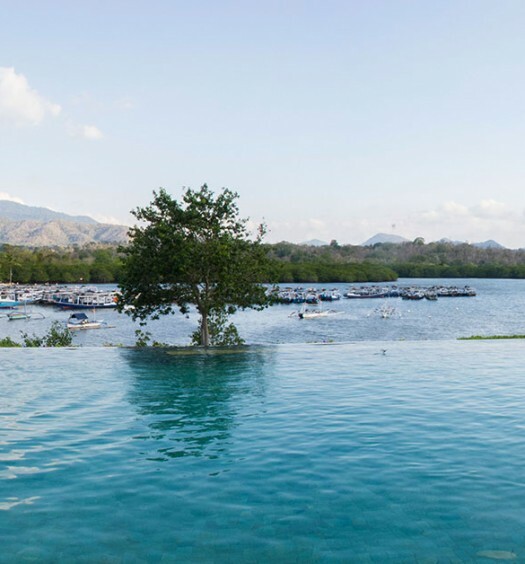 The private infinity pool also gives you a panoramic view of the forested area for miles and miles, so you feel like you’re on an island all by yourself and your loved ones. 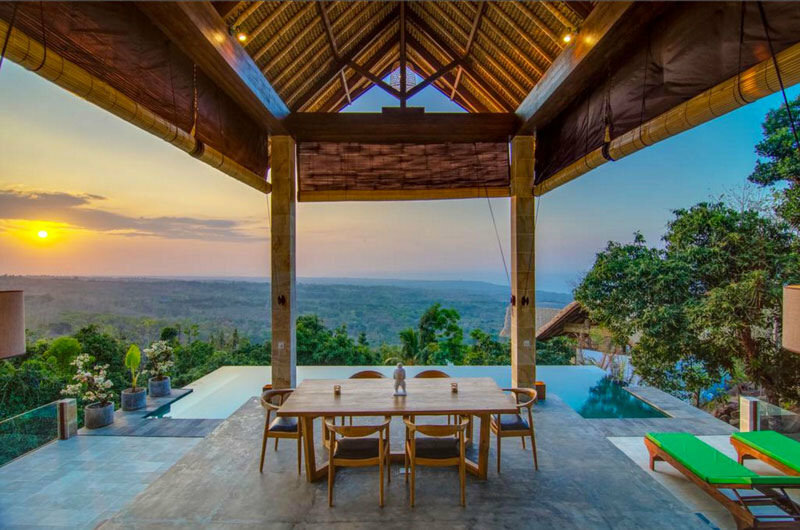 From its position high up on a mountain, this open-concept villa looks just like a luxurious mansion – not only is it beautifully decorated with spacious living spaces, you’re also surrounded by uninterrupted views of the untouched natural scenery in the area. If you want to party it out with your friends, this large villa is an experience you won’t want to miss. 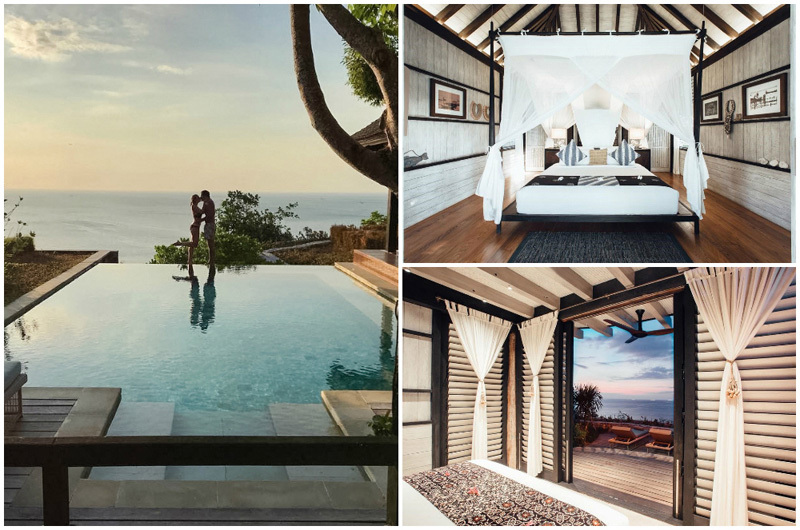 Want to experience Bali life as much as you can? 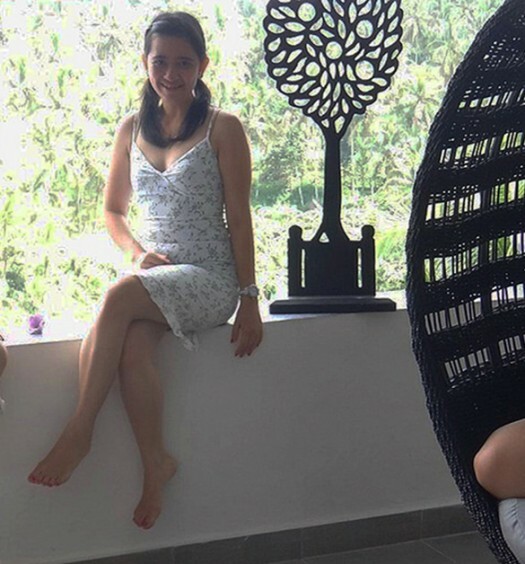 Stay at Samanvaya Villa. 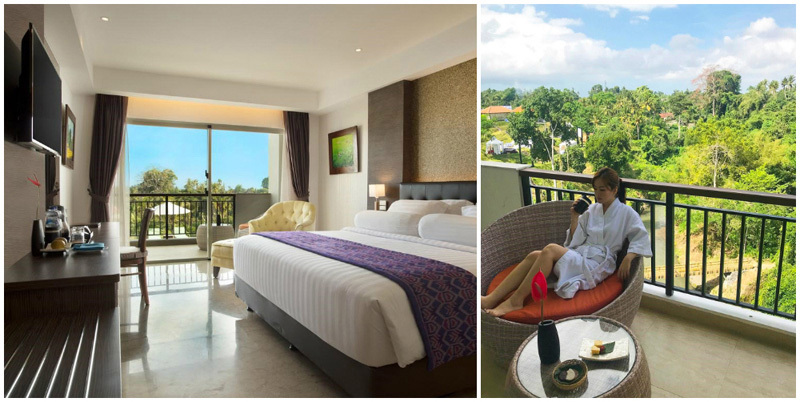 The hotel is strategically located only 35km (1 hour) from the center of Ubud, providing easy access to all the facilities that you need in the city. With its strategic location, this hotel makes it easy to explore all the tourist spots in the city. 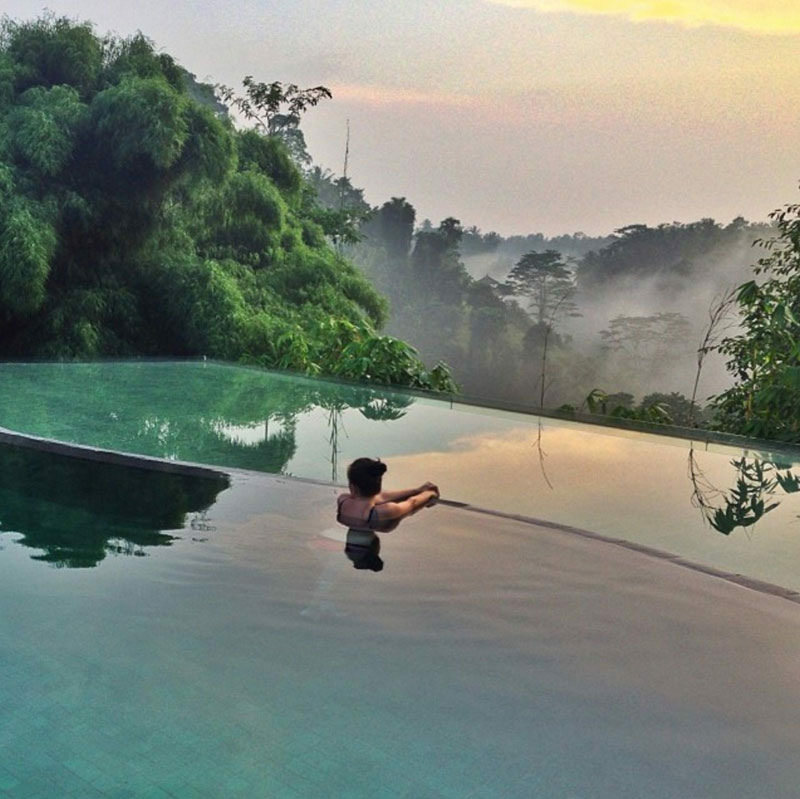 But of course, the most important thing is the infinity pool with uniquely Ubud views. 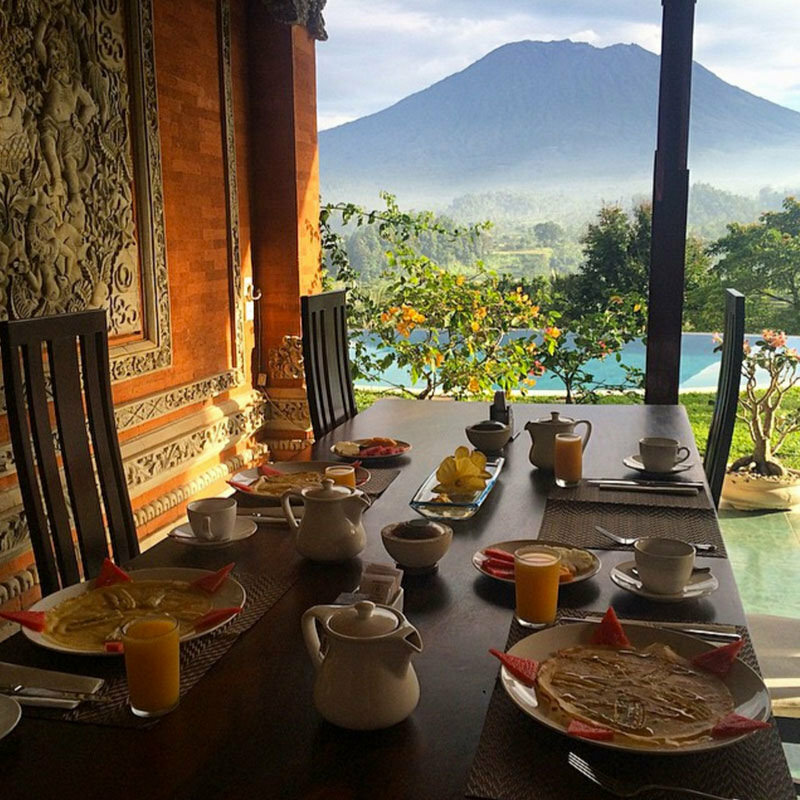 Gorgeously hanging over a valley of sloping rice terraces, the views here are not to be scoffed at. To top off the experience, enjoy your days at the pool with a delicious drink or 2 from the bar! The swimming pool will make you feel at home for hours – and you can also enjoy a massage in their spa. 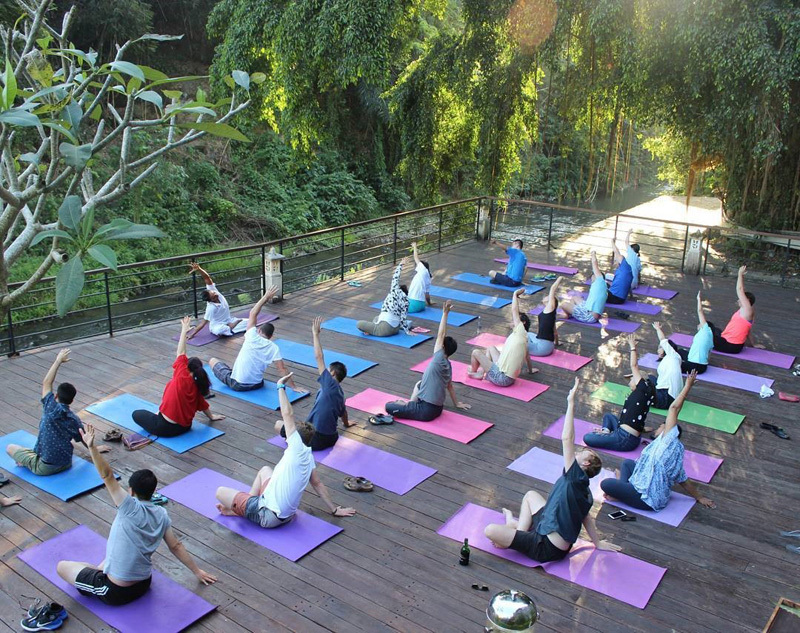 If you’re a yoga-lover, why not join a yoga session at Samanvaya? 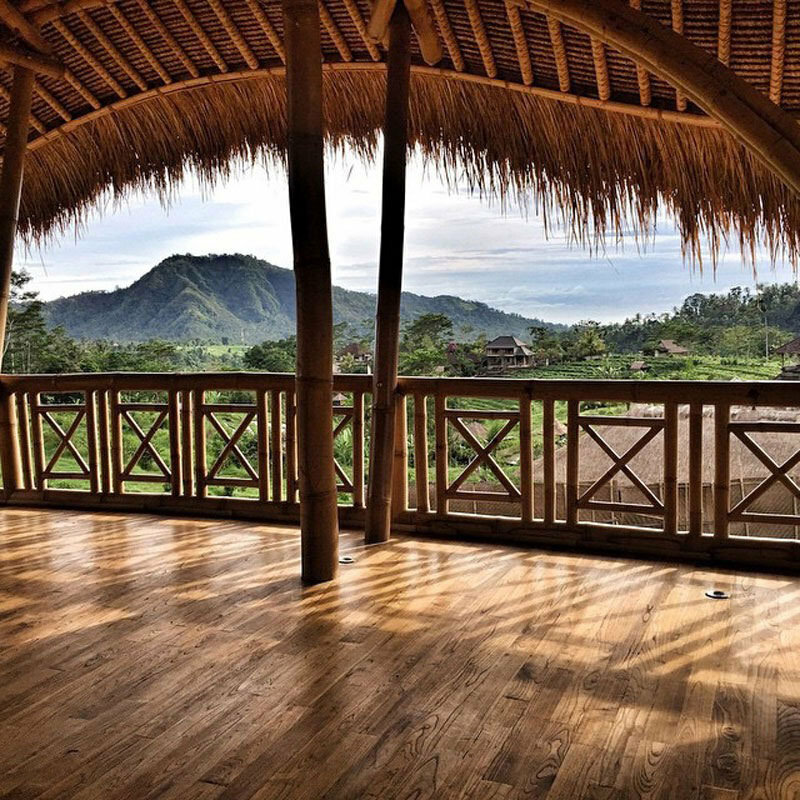 Yoga at the in-house studio with those verdant views of the valley, it’s a dream come true! 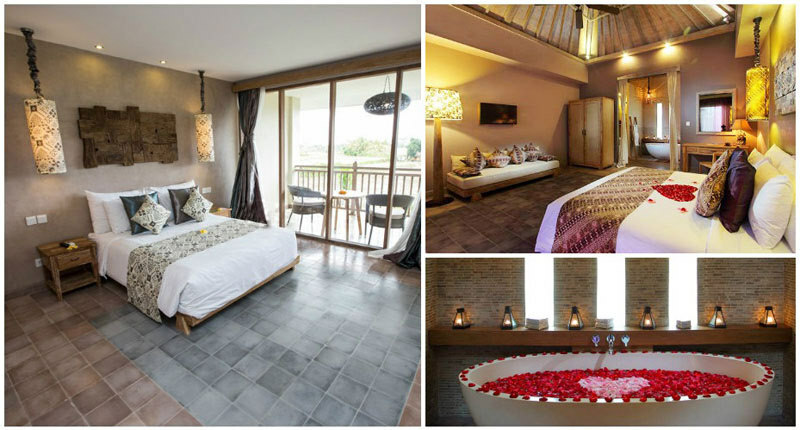 Additionally, Samanvaya Villa provides full facilities to meet your needs. Wi-Fi is available in all rooms, along with a 24-hour front desk should you need help at any time of the day – and more facilities provided for the convenience of guests. 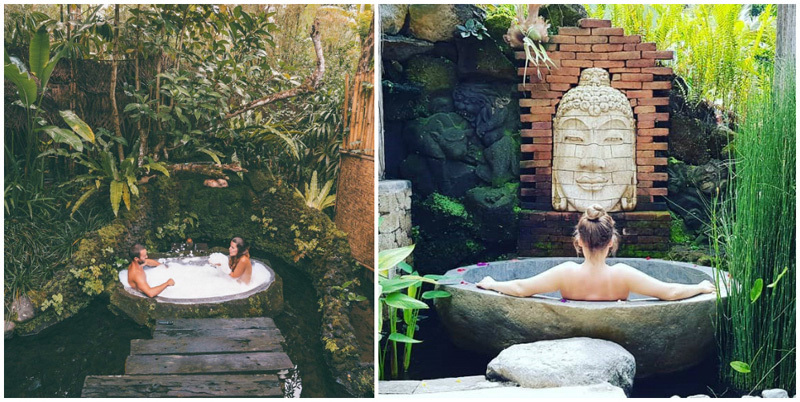 If this is your first trip to Ubud and you are looking for a bit of luxury on a budget, look no further than Mathis Retreat. 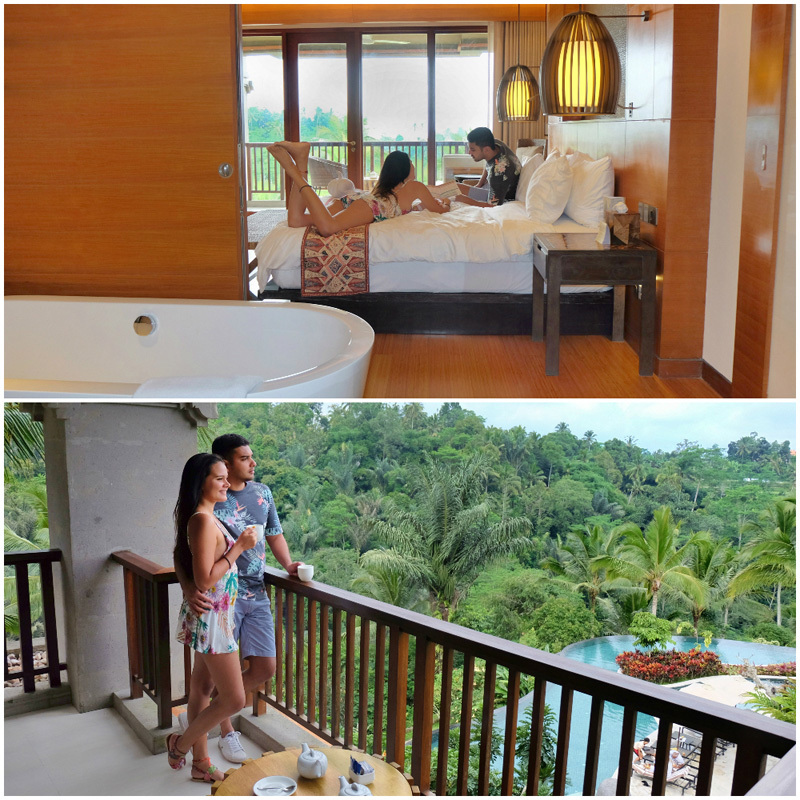 The lush surroundings will bring calm and relaxation to your holiday. 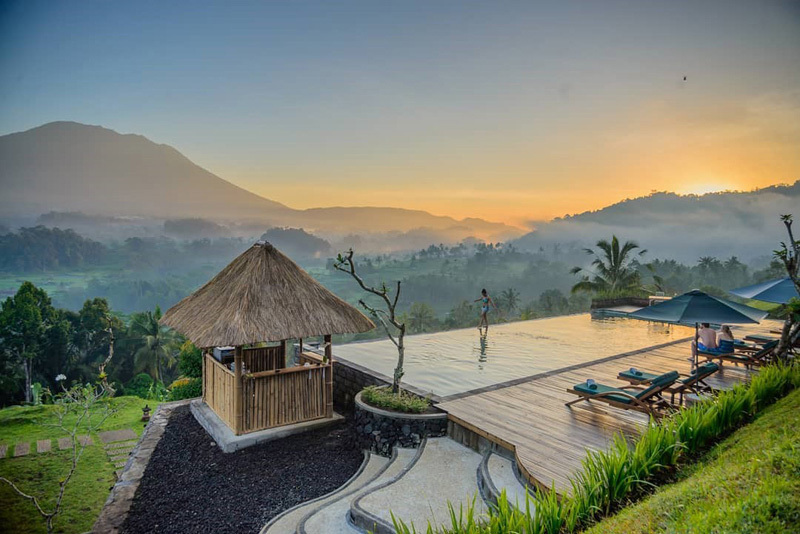 Its astounding infinity pool looks directly onto bright rice paddies. You’ll be amazed how often you and your significant other can have this piece of paradise to yourselves. 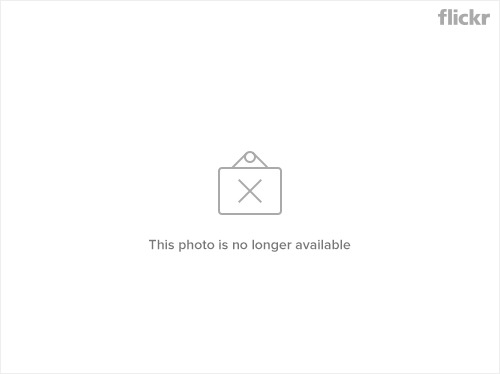 The Mathis Retreat is run by the famous luxury hotel community known as The Mathis Collection. 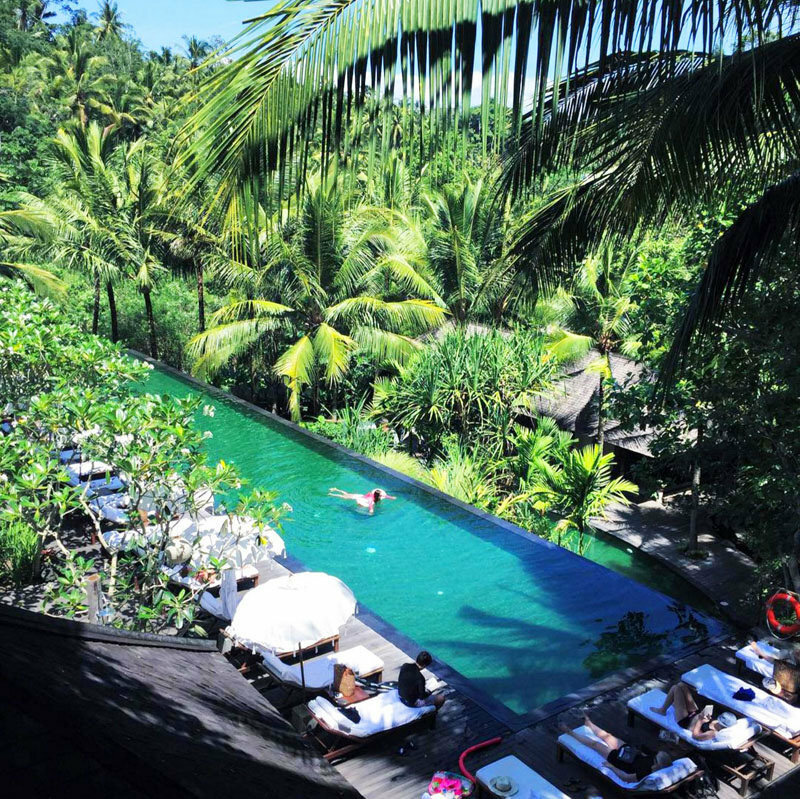 This well-appointed hotel is tucked away from the crowds of Ubud but within a quick walk of the area’s attractions. The luxury continues from the common areas to the accommodation. Each of the 21 rooms and bungalows includes internet access, a sofa, a TV and air-conditioning. A relaxing spa and delicious restaurant round out the ample facilities. You’re guaranteed memories to last a lifetime from your stay at Kenanga Boutique Hotel! 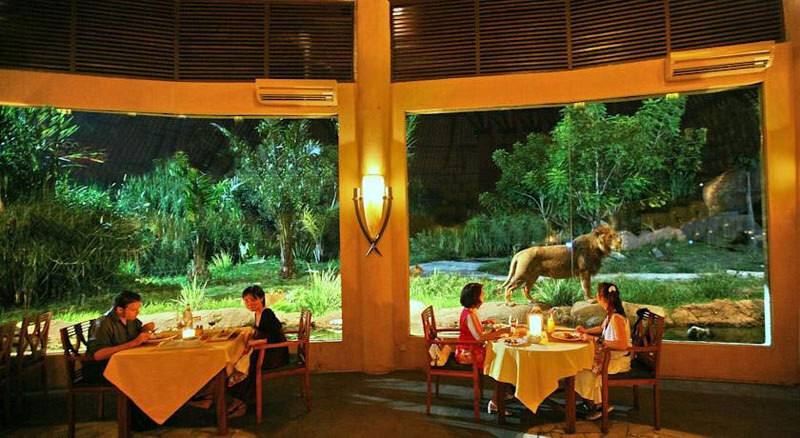 PS: You might also want to try dining at Terracotta Ubud that’s located just around the area. 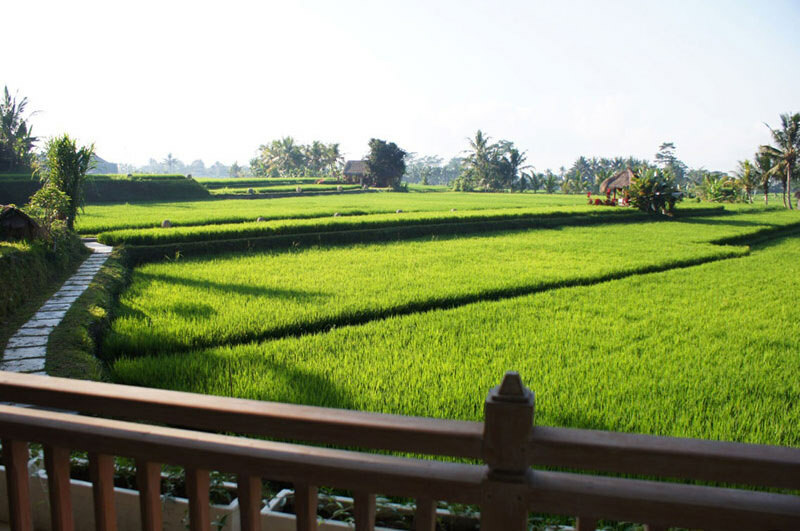 This Ubud restaurant with lovely views is housed in a traditional open sided Bale, and the authentic Indonesian cuisine is also all beautifully presented and full of mouth-watering flavours. One of the best things about Mara River Safari Lodge, is the infinity pool with a view of the rhinos and zebras, and even scampering lion cubs too. 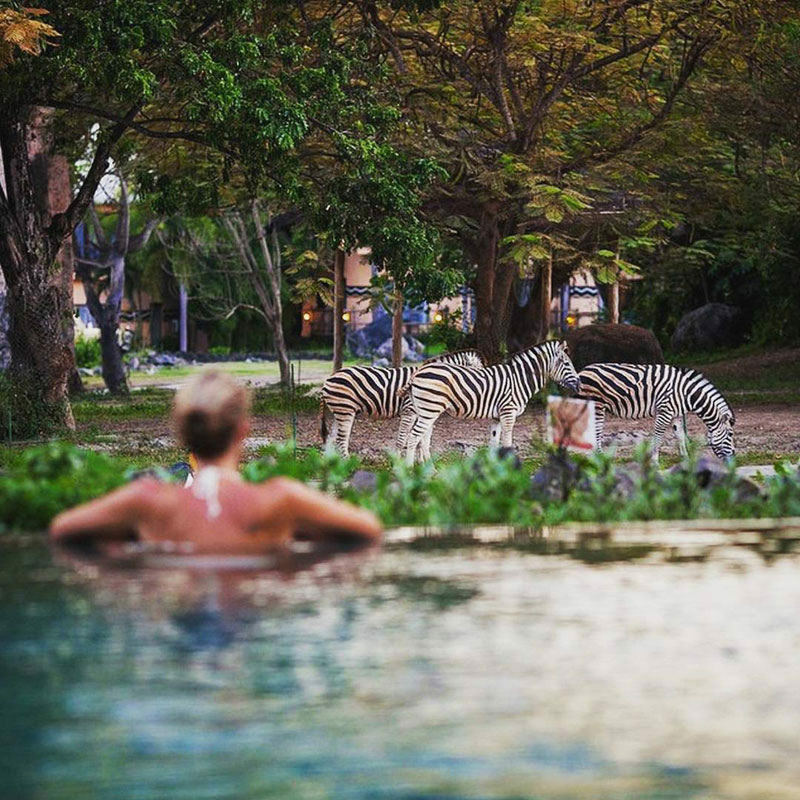 Imagine having a lovely soak in the pool, while watching the rhinos and zebras graze together. This super unique accomodation combines luxury and adventure perfectly – now you don’t have to fly halfway across the world to have an African safari adventure – you can get it at the Mara River Safari Lodge. 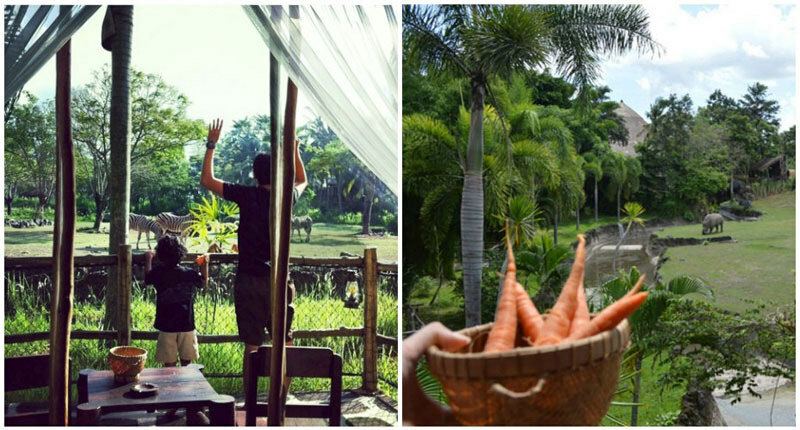 Not only will you get to feed carrots to zebras, rhinos and elephants right from the comfort of your own balcony. On a similar vein, young children will love the petting zoo, informational performances and the vibrant Disney-esque Bali Agung show, which also features props that are completely handmade by the staff! We’d love to say more, but you’ll have to make a personal trip there to experience the wonders of this place.  This we’ll say – you won’t regret it. 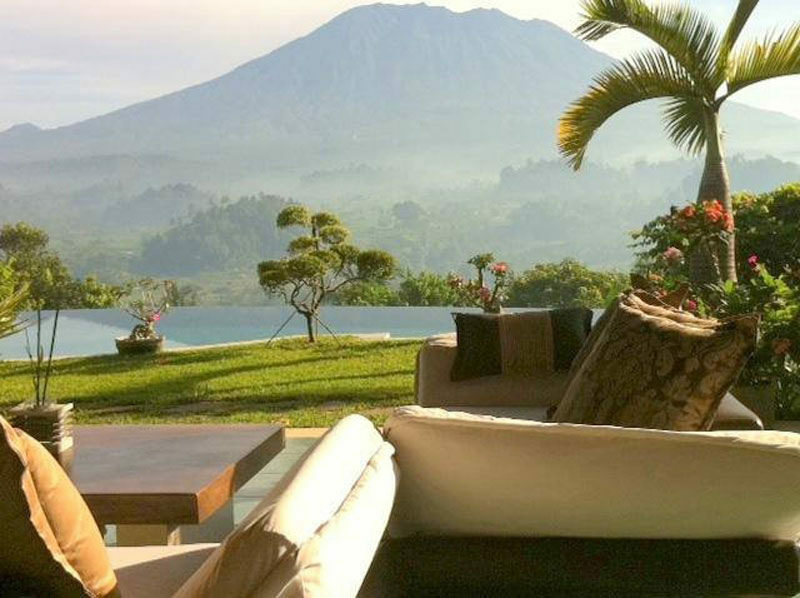 Villa Sidemen Bali is not only home to pristine beaches, but also to dramatic volcanoes – both active and extinct. 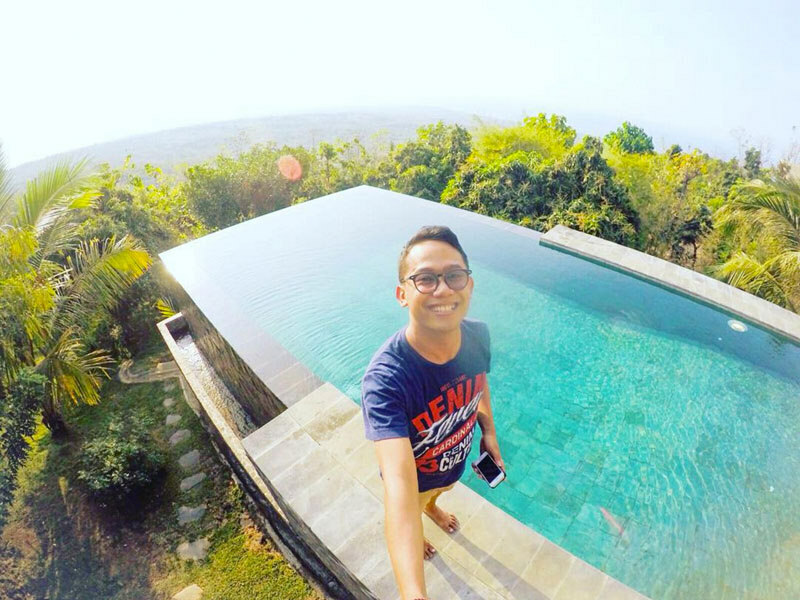 And at Villa Sidemen’s infinity pool, you get to fully take in the dramatic views too. 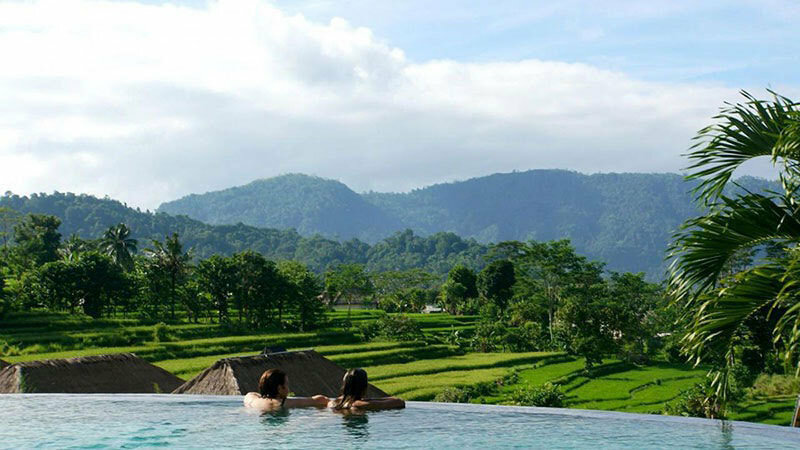 Spend days lounging in the infinity pool to views of the misty mountain, and miles and miles of forests below. It’s utterly relaxing and you’ll feel truly spirited away from all the stresses and worries of everyday life! And how indulging would it be to wake up to the same climactic views? With the large windows, you can be sure to enjoy the view from the living room, or even while you’re still snuggling in bed! 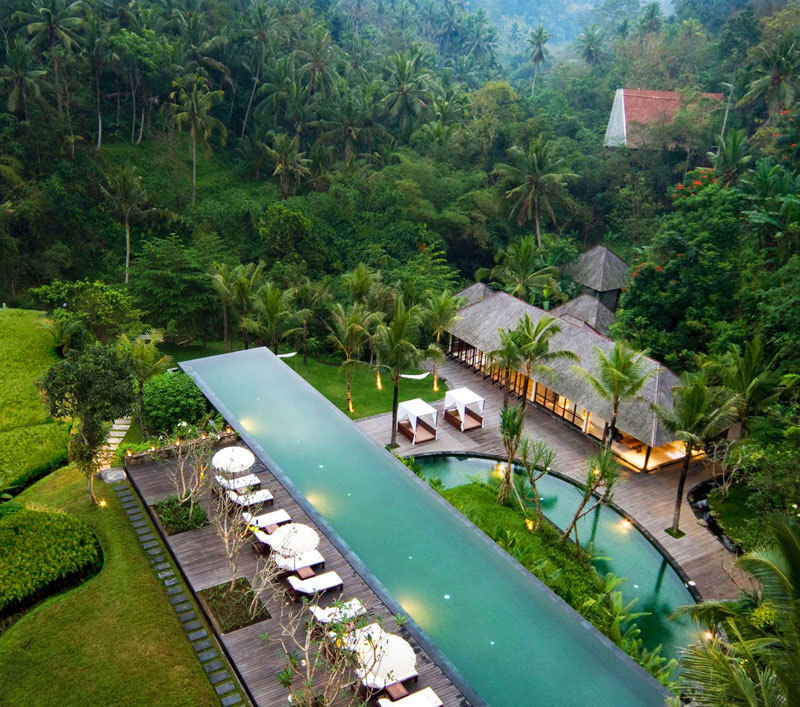 Komaneka Resorts in Ubud are a collection of carefully curated boutique hotels. 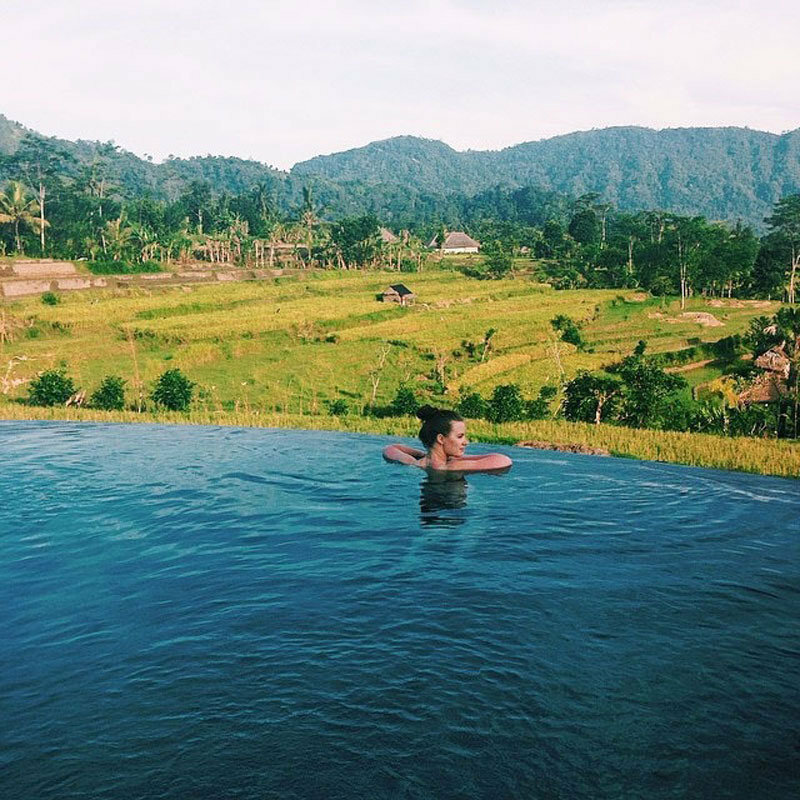 In particular, Komaneka at Bisma offer the chance to relax in unique infinity pools with stunning views. 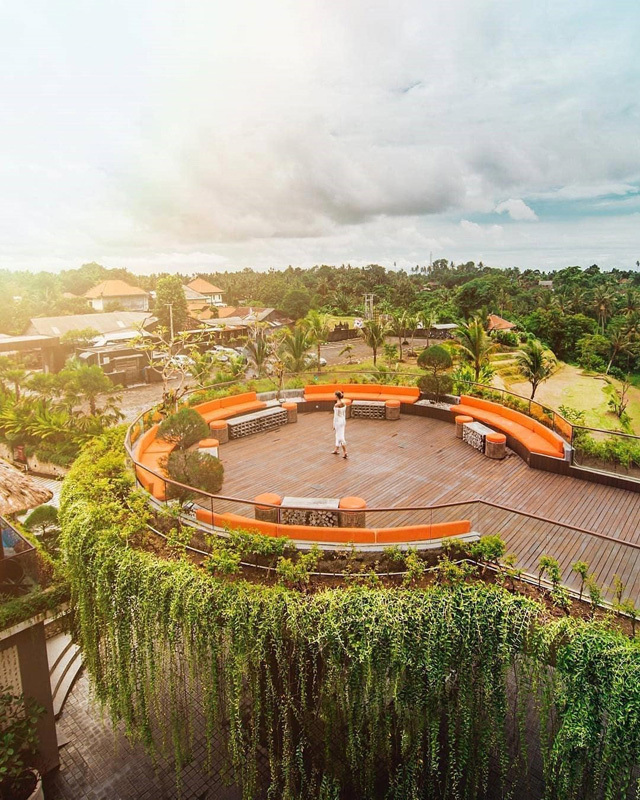 At Komaneka at Bisma Ubud, you’ll enjoy heart-lifting vistas over the surrounding rain forest within a ten minute walk from downtown Ubud. The 33-meter infinity pool is nestled within the tropical gardens and the resort’s rice paddies. An additional, semi-circular leisure pool sits below the infinity pool and is surrounded by sun bed huts. You’ll feel like you’re in paradise, lounging beneath the shade with white curtains billowing in the breeze. Every room at Komaneka at Bisma comes with a view and spacious living area. Suites also include personal lap pools secluded in nature. Are you an art lover with an eye for aesthetics? 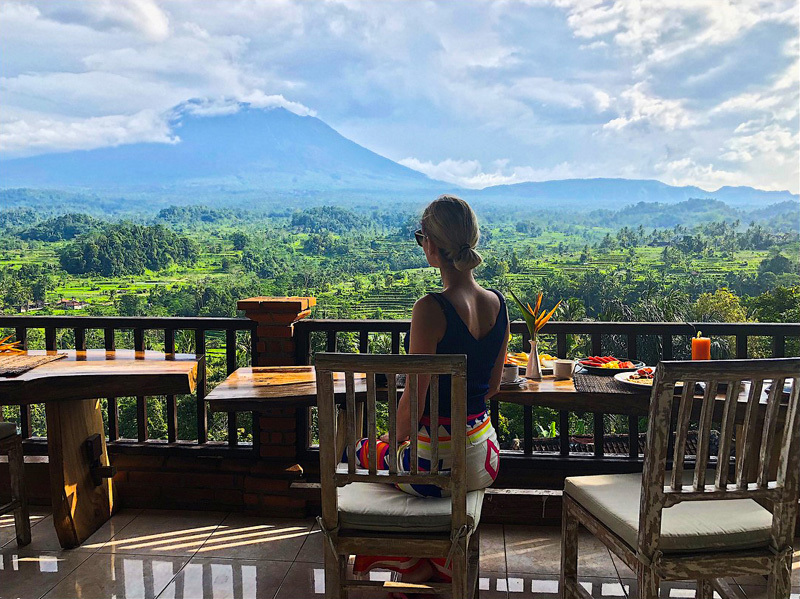 You’re going to love staying at Tanah Merah Art Resort Ubud where locally crafted wares are combined with a natural setting. 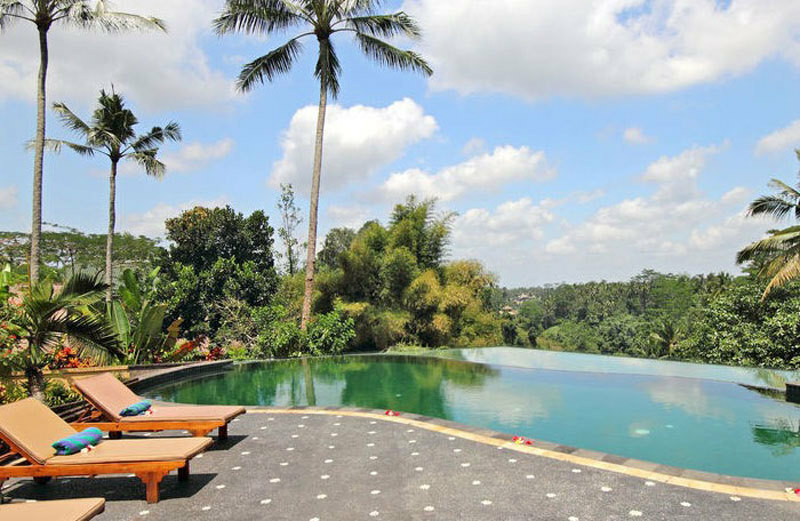 The crown jewels of the Tanah Merah Art Resort are the brilliant infinity pools. 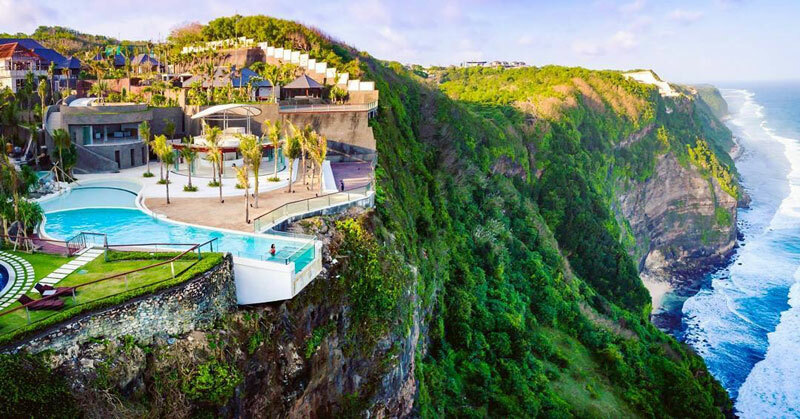 Two shared infinity pools are perched high above the dramatic gorge of Tukad Petanu, a.k.a. the Cursed River. Other pools are perfectly placed to separate each villa and allow guests to feel secluded in nature. 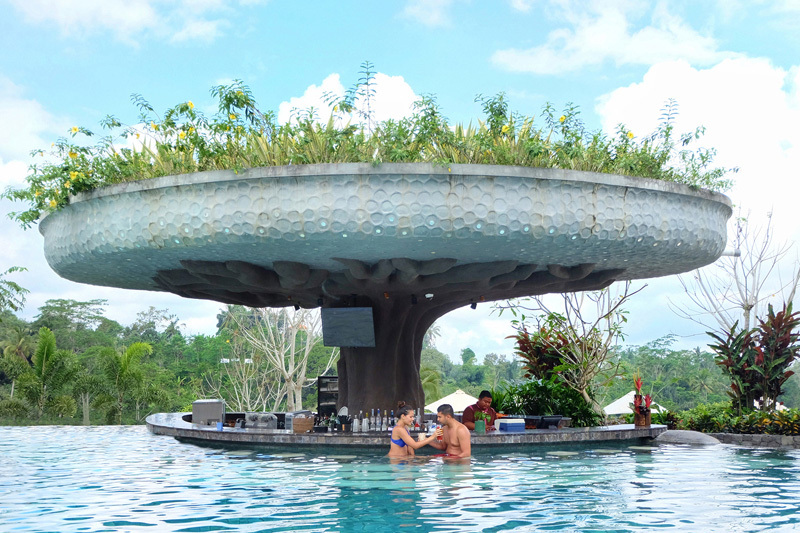 Not only does Tanah Merah Art Resort deliver in terms of a unique infinity pool, it is also home to an art museum full of artifacts collected from across the region. As a guest of the resort, you will enjoy special access. Finally, holidaymakers can expect plentiful facilities. A fitness center, spa, billiards table and table tennis are available for guest use. 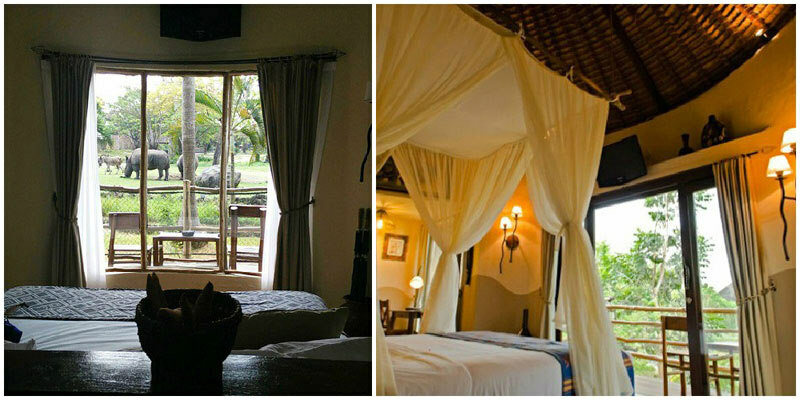 All rooms come equipped with views of the jungle, TVs, WiFi, bathtubs and air-conditioning, not to mention local, artistic decor. 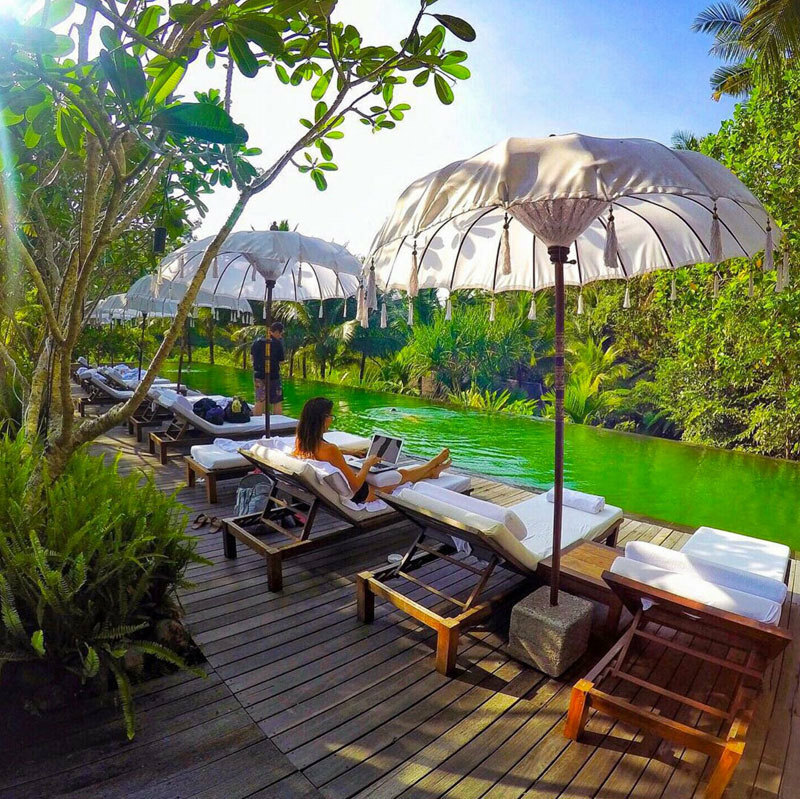 While you might want to hang out in your artistic room or around the infinity pool throughout your stay, Ubud is only a 15-minute drive away. The resort supplies guests with bicycles to travel back and forth. 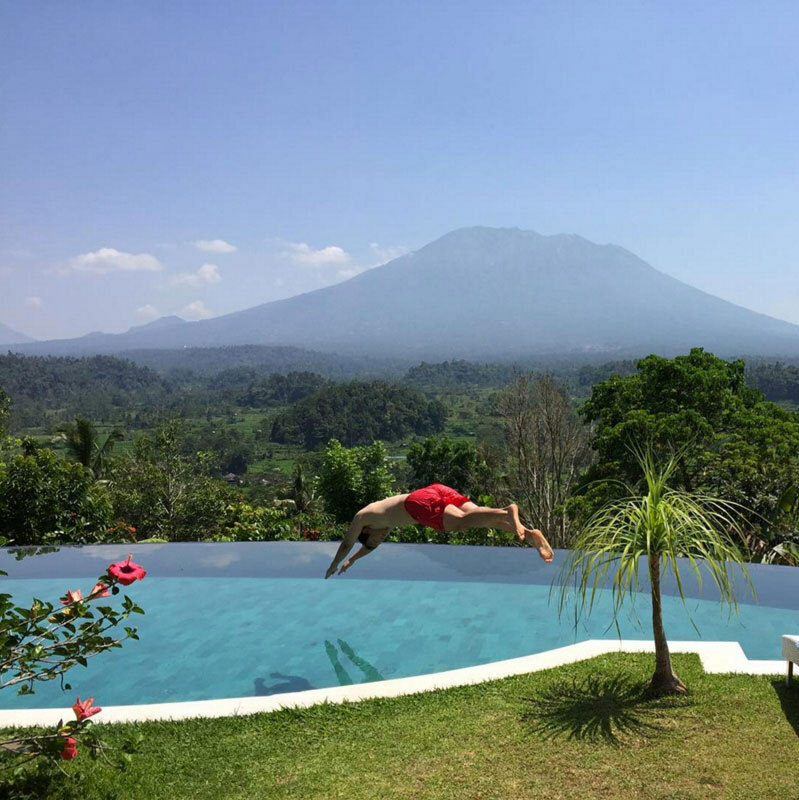 It’s a great way to enjoy the classic Balinese topography! 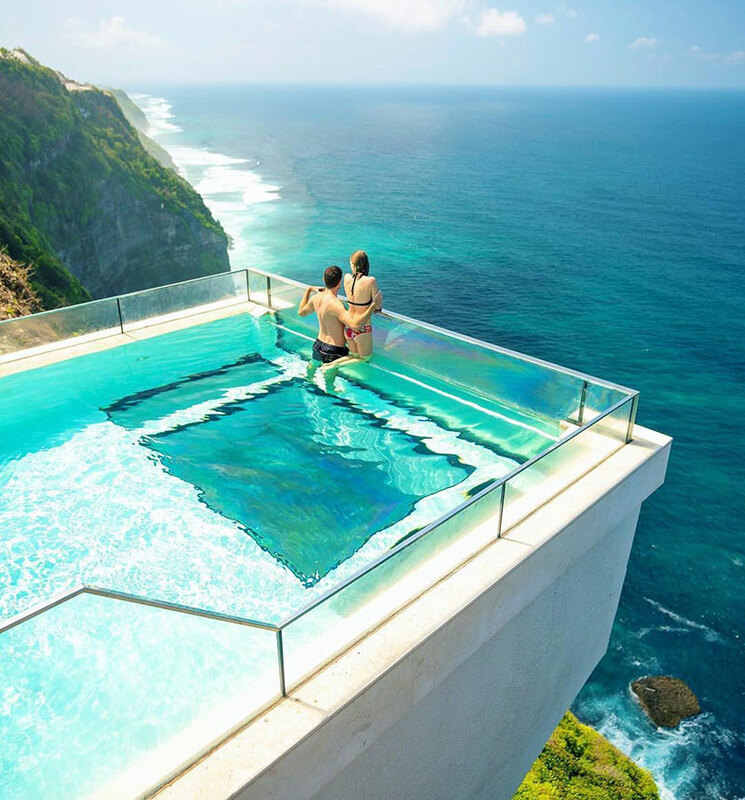 Bali-lovers, do you know of any other amazing infinity pools with great views that should be on this list? If so, let us know in the comments below. We’d love to include your suggestions in our next article!